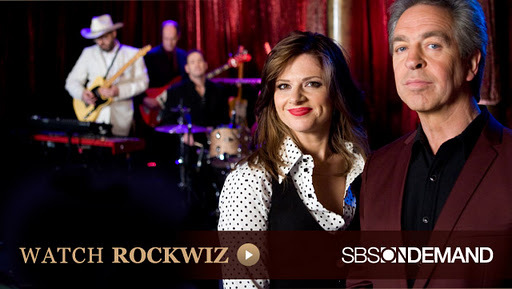 Song of the day: Amy Findlay and Nick Barker – "Itchycoo Park"
I watch an Australian TV rock music quiz show called RocKwiz. It’s shown every Saturday night, and I love it. Nice. It has a nice tropical feel to it. It’s nice. (I can’t really think of another word to describe it. It’s nice.) I’m not entirely sold on Brett Dennen’s voice, though. It’s OK, but I don’t warm to it as much as the rest of the song. Unfortunately for me (and possibly him), the sound of his voice reminded me a little of Carol Channing. (Yes, Carol Channing.) But as far as the song itself is concerned, I liked it. It’s nice. However… I wasn’t especially enamoured with Femi Kuti’s appearance – either his asides (echoing the last bits of Brett’s singing in the verses), or his “featured” contribution from 2:39 to 3:00. I thought it was OK but fairly pointless. I’ve never been a fan of all those “feat.” / “ft.” (and, worst of all, “vs.” – ugh) songs where a ‘celebrity’ artist is wheeled into a recording studio, adds a “Whoa” here and a “Whoo” there, and then the record company proudly announces the participation of said ‘celebrity’ artist in a cynical attempt to increase sales (“Look, everybody! We have [insert name of superstar artist here] on this track! They’re not doing much, but you’ll want to buy because they’re on it! Won’t you? Sure you will, because [insert name of superstar artist here] is on that track!”). Well, that’s how I see it, anyway. I suppose it is possible that the (non-‘featured’) artist actually wanted the guest musician to appear in their song (albeit offering a minimal contribution). I’ve listened to “Make You Crazy” four times now, and I still like it – despite Femi Kuti’s interjections. Robert Palmer: The Man with Impeccable Taste. Has Monsieur Palmer ever released a dud song? Ever? If he has, I haven’t heard it. “Johnny And Mary“? Excellent. “Some Like It Hot“? Excellent. “Every Kind Of People“? Excellent. I always found it amazing how Robert could easily (and convincingly) slip into pretty much any genre of music. With “Man Smart, Woman Smarter” he effortlessly channels Little Feat – and his singing is, as always, superb. What a voice! Robert Palmer. Class act all the way. Although I’m usually allergic to country music, there are two exceptions that I will go out of my to hear: Hank Williams and Roger Miller. I can’t get enough of either artist. Incidentally, when I played “Engine Engine #9” again straight after listening to it, I noticed that during the song it had changed key somewhere. I didn’t notice it the first time, but on the third listen I found it: the key change happens at 1:04. (Boy, this is useless information.) I love pretty much everything about this song. (It’s Roger Miller. I can’t help loving it.) However, I’d like to single out the drumming for special praise – I thought it was the highlight of the instrumental backing. Every time I listen to the song, my ears zoom in on the sterling bass drum work (it’s in the left channel, and it’s fabulous). The dreamy bit at the end of the song: wonderfully dreamy. Heard more than enough times courtesy of Australian radio’s insistence on playing nothing else by Small Faces but “Lazy Sunday” as the representative Small Faces song: yes. Still like “Lazy Sunday”: unbelievably, yes. Song of the day: Town Criers – "Hey Girl"
“Hey Girl” was the B-side of “Love Me Again” which, I’ve only just noticed, was Song of the day less than a month ago. Oops*. You are currently browsing the archives for the Small Faces category.